A week ago yesterday, we left for Cape Town. The plan was to leave early, to make it to the morning markets, but life with children never goes exactly as planned. It’s a 4 hour drive, and the National Highway (N2) from Mossel Bay to Cape Town lies at the foot of several mountain ranges, make it quite a scenic trip. Or hotel reservations were at the downtown Best Western, which was reportedly a nice place to stay, complete with kitchenettes in the rooms and two pools on the property. Had it not been for a mosquito-infested room and my son getting multiple bites on the face, one of which swelled up to the size of a foos-ball (on his eye-lid, of course, making him resemble Quasi-moto), we might not have checked out after the second night. Fortunately for us, the Victoria & Alfred Hotel on the Waterfront had availability, but this meant that we would have to check our dog into a nearby kennel for the remainder of our time in Cape Town. Just one look at my son’s face was all I needed to be convinced that this was the right decision, and within a few hours we were all settled into our new room on Cape Town’s glorious Waterfront. One of the highlights of our time in Cape Town was definitely shopping. It’s much easier to find cute kids clothes in South Africa’s larger cities, so we spent some time at the Canal Walk and Waterfront shopping malls. We also tried to visit the shopping area known as Cavendish Square, in the portion of Cape Town known as Claremont, but it appeared fairly unattractive from the street, and so we settled for a little hike on a path called the Liesbeck Trail. The Liesbeck Trail is surprisingly beautiful, and I certainly didn’t expect to come across such a nice little nature trail in the midst of one of South Africa’s largest cities. At that point, we still had the dog with us, and since he’s a water dog, and the trail runs along a small river, he really enjoyed his little afternoon frolic. We also made it up to the Rhodes Memorial, a memorial dedicated to Cecil John Rhodes, a British explorer, powerful mining magnate, Prime Minister of the Cape Colony (and proponent of Colonial Expansionism). The memorial, which was completed in 1912 (a decade after Rhodes’ death), is as impressive as an ancient Greek temple, complete with huge columns and massive lion figures sculpted from local granite. Food in Cape Town is also unrivalled, and we visited some of Cape Town’s best restaurants throughout our trip. Even South Africa’s finest dining establishments are surprisingly affordable on a Western budget, something we’re really going to miss back in Europe! From Marco’s African Café (with live entertainment and super friendly service) and Cape Town Fish Market (with a Japanese-style tepanyaki area and sushi counter) to Morton’s on the Wharf and Krugman’s Grill (both of whom hae fantastic steak! ), we had some wonderful food during our trip. Beyond compare, however, was Baia Seafood Restaurant at the V&A Waterfront. This was the freshest, tastiest, fish we have without a doubt ever had, and the service couldn’t have been better. The setting is also unbeatable. You can ether have an outdoor table looking out over the harbor, or a cozy indoor spot on your own sofa – so romantic! It can be impossible to get a table here on the weekends, but we called ahead and lucked out. And no trip to Cape Town is complete without visiting the seals down at the water’s edge, so I took the baby along to say hello. Some were basting in the sun, while others slyly swam along nearby boats, probably in search of food. The Two Oceans Aquarium (also at the Waterfront), is an excellent spot to see seals, penguins, and other marine animals, and we try to make a family outing of that whenever possible. In conclusion, we had a fantastic time in Cape Town. 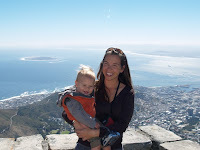 Had I had someone along to help look after the baby (while my husband was working), I probably would have done a Township tour or a trip to a nearby museum, but some things must be left for our return to this fabulous city! The air was cold, which is why I was quite surprised at the contrast as I sat on the warm grass. The sun’s rays cut through the cold air, penetrating the earth, the emerald green grass, and the resident Springbok which were grazing upon it. Normally I have the dog and baby with me, but today I was walking alone, listening to relaxing music on my MP3 player, and admiring the Fynbos (South Africa’s native plants) and Springbok (accompanied by some Guinea Fowl, Thick-Knee, and Crowned Plover - all native birds). As if that weren’t enough, the soft blue silhouette of the mountains provided a dream-like backdrop to it all, beckoning me to stay a while. It was so perfect that I was overcome by many emotions. What an incredible tapestry of life. I was on my way home, having just taken a little time to read my latest lecture for my online travel writing class. The most important lesson from this week’s lecture? I think it would have to be the teacher’s statement about avoiding long-winded writing that resembles “Uncle Benny’s Vacation Slides”. So no more, “Day 1, we went here... Day 2, we did this”!!! Although I have a lot to learn, I feel like this is definitely the next career for me. I don’t remember the last time I got so excited about reading lecture notes! But now it’s time for me to tell you about our Easter here in South Africa (above left). Overall, it’s a much respected and observed holiday. Most people have the Friday and Monday of Easter weekend off, making it a long weekend. For this reason, our sleepy little village, Mossel Bay, was once again a hopping tourist destination, and along with ridiculously full parking lots and (what we now consider) unimaginable traffic, many standard supermarket items, like mineral water and wholegrain bread, were nowhere to be found. On Easter itself, we, along with what seemed like the majority of the Western Cape, decided to have a picnic in a town called Herold’s Bay. Despite the crowds, we really enjoyed spending a little time on the beach, and the weather was perfect. The baby’s still skeptical of the sand, but he seemed to really enjoy the water. To quickly recap the milestones of the past week, on Wednesday, after we brought my sister to the airport, we attempted to put our own socks on for first time (and by “we”, I mean the baby). He also began talking A LOT, figured out how to “blow” bubbles, and has really taken off with walking (today especially!). Furthermore, he’s nearly perfected his summersaults (although he still needs a bit of help! ), started dressing his stuffed animals up (also with Mommy’s help), learned the value of kisses (and how to use them as a secret weapon after you’ve made someone mad, and finally, on Easter itself, he made his first “tooting” noises in an effort to mimic the original sound (ummm, from the dog, that is). As for me, I’ve begun the online writing course and my first pieces have been published (online). Yay! And the hubby keeps very busy with work, although we were very grateful to have him all to ourselves for the 4-day weekend (over which he sliced his thumb open while cooking and had to get stitches)! Oh, and Monday we had a few people over for dinner. We “braiied” (or grilled) fillet mignon (which is dirt cheap here) on our indoor grill. This week has been pretty quiet. I’ve just been reading, writing, and enjoying family life and life as an expat. Life is good! Our next adventure, scheduled to begin tomorrow, is a 5-day trip to Cape Town. I’m hoping to get an early start, so we can make it to a couple of weekend markets in the morning. Better get packing! The last couple weeks have been fairly anticlimactic. The weekend before last (March 24th), we took my youngest sister up to the Sedgefield Markets and Knysna Heads (wow! they sure are incredible! ), while my other sister prepared for her backpacking trip out to Port Elizabeth. The following day we headed out to Diaz Beach, where we tried to get the baby acclimated to that strange stuff we call sand. He really got a kick out of the beach ball we brought along, and seems to favor his left foot when playing soccer. That Monday I had to drop little sis off at the George airport, as it was time for her to return to the States. We were sad to see her go! Since we had friends visiting from Germany, we still had plenty of company at home, and lots of help with the baby! As for the baby's development, two weeks ago (on Tuesday) he begun to use the word "up" quite frequently. It's so neat when they're able to start communicating their wants and needs! The following day he started using the word "apple"... for the fruits AND the juice! On Thursday (March 29th), our little man began to understand what a "pocket" is (I stuffed little finger puppets in his pockets, and later, asked him what was in there... he reached in and pulled the finger puppets out!) The following night he must have been cutting a couple teeth, since he wanted to nurse throughout the night and was pretty fussy. Last Saturday, we went to a farm out near an area called Vleesbaai, where we supposed to be in a music video for a popular Afrikaans musician named Anton. The logistics didn't work out, but it was such a beautiful old farm house, and the setting was nothing short of spectacular (see above photo). A large river ran right through their property, and it was at the foot of the mountains. Sometime around the weekend, he began to use hand gestures more regularly, putting his palms up, as if to say, "I don't know". He also began saying, "Awwooo?" for "hello" (while holding assorted objects to his head - like a phone). And that Sunday, the baby began saying "cheers" a lot, while holding his drink up in the air. He also began to look much more stable while walking. He's still only taking 5 or 6 steps at a time, but he's so excited about learning to walk! Also on that day, we took my remaining sister up to Oudtshoorn for an arts festival known as the KKNK. Unfortunately for us, every last details of the festival is in Afrikaans, and all three events that we attempted to attend didn't work out (apparently, in stark contrast to daily life in South Africa, at this festival, punctuality is key, and if you are just one minute late, you can forget about being let in). On the bright side, our return drive through the mountains was quite pleasant, and the baby slept the whole way. Last Monday (a week ago today), we took my sister to a hip Cuban restaurant here in Mossel Bay, Café Havana. The food was good, but the baby was a bit restless. The following day, I drove my sister to Botlierskop for a game drive, since she hadn't seen any giraffes on her game drive in Addo Elephant Park. She seemed to enjoy the game drive, and Lukas and I enjoyed our time lounging around on the terrace of the restaurant, overlooking the valley and surrounding mountains. We saw our first Knysna Loerie in the tree just next to us - what a beautiful bird! On Wednesday, I took my sister to a birthday breakfast for a friend of mine. Breakfast was at The Point Hotel. The Point, which is one of the most spectacular spots in Mossel bay, is a type of peninsula, surrounded by jagged rocks, and well-known for it's surfing, and the Khoi Cave (once a dwelling for the Khoi people - it's complemented by ancient cave paintings and lots of rock dassies). After breakfast, we headed out to the airport once again, this time to drop the last of the family visitors off, just before Easter (how sad is that?). And so we geared up for our Easter weekend in a strange country, without family. But don't fret, it actually turned out to be quite nice! Check out the next entry to learn more!